If I sold stock earlier during Bubble 1.0 and if my house had a basement I’d get an SC5832. SC stands for SiCortext, a Polaris portfolio company I’m involved with. 5832 is the number of processors in this dense Linux supercluster. Not only is the performance breathtaking but the machine is as green as it gets–optimizing power consumption is the secret behind the performance of SiCortex machines. Lower power means you can have more processors closer together so that the interconnects paths between them are very short => very fast CPU-CPU communications & better parallelism. If you are into this stuff, go through the SiCortext architecture tour. The SC5832 is finally shipping. Argonne National Lab just bought the first machine. Lucky them. The open panels remind me of Lamborghini doors. This entry was posted in startups and tagged HPC, Linux, Polaris Venture Partners, SiCortex, startups. Bookmark the permalink. I’m currently recompiling Linux kernel modules, and it’s taking forever. Man, do I wish I had a beast like that to take care of the job! 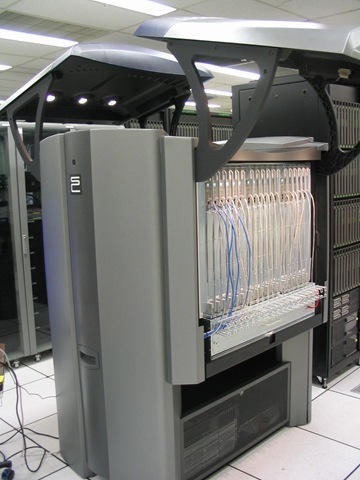 I am looking for more pics of this BEAST…I first saw it in a Linux Magazine article in Feb 2007. I love it….do you have any more pics ?